On the face of it, road groupsets seem to be one of those personal choices we all fall into. “Well, I’ve always ridden Campagnolo…” However, if we had to choose a new bike with a choice of groupset or just wanted to buy a new groupset, without any thoughts of previous experience, what are the broad benefits of each manufacturer’s mechanical groupsets? 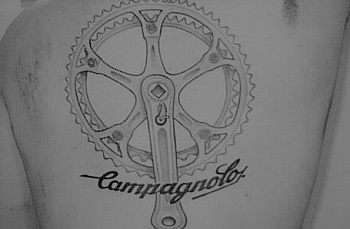 Campagnolo has history. The Italian brand invented a lot of the features of bikes which we all take for granted, such as quick release wheels and the rear derailleur. When you buy a Campagnolo equipped bike or groupset, you are buying in to the history of the sport, the latest in a direct line of products engineered in Vicenza, Italy. Campagnolo hold around 2000 Internationally registered Industrial patents within cycling. In recent years Campagnolo have produced several innovations which offer unique benefits and characteristics for their groupsets. Campagnolo continue to strive to innovate, their latest 12 speed groupsets were a step ahead of the competition in 2018. As a side note, Campagnolo wheels are also great, in addition, they own wheel brand Fulcrum too. One benefit with Ergo levers is that they are extremely comfortable for most hands. The latest hoods are soft and tactile. The Ergo lever features a fixed outer brake lever and an inner shift lever which works in conjunction with a small thumb lever on the inside of the lever hoods. Record and Chorus Ergo-levers make it possible to shift up 3 sprockets at a time – with one push of the lever. downshifts too, allow up to 5 sprockets at a time with one push of the thumb lever, useful if you ride in an area with short steep hills. Ergo levers also have simple internals with fewer parts, making them more fixable by the home mechanic. Since mastering the aluminium finish on their mid to late 1980’s C Record and Chorus groupsets, Campagnolo has been at the forefront of bringing bling finishes to components. Chorus, Record and Super Record carbon components are almost jewel-like works of art for your bike. Campagnolo have also gone the extra sprocket recently with their latest 12 Speed offerings. Disc fans too are not left out, with disc stoppers now added as an option for their high-end groupsets. Campagnolo’s 12 speed groupsets released in 2018 were a surprise step ahead of the competition. If you crave an extra cassette sprocket on the road, then Campagnolo is currently your only option. Most Campagnolo users love the crisp, solid, clunky feel which only Campagnolo offers. The often used mantra of a Campagnolo fan is that Campagnolo ‘wears-in’ while others ‘wear-out’. Campagnolo still has the wow factor with its component finishes – whether that’s in elegant aluminium or beautiful ‘bling’ carbon. Not many other cycling brands inspire enough devotion amongst fans to commit ink to skin… Pic courtesy of Pintrest Bicycle Tattoo. Shimano dominate the world of cycling. The vast majority of bike riders across the world ride on Shimano for good reason; Shimano components are reliable, perform flawlessly and offer decent value for money. Being first to release the integrated brake and gear lever with their STI lever gave Shimano road components a huge boost from 1990. Since then, they have improved through each new range. The latest 11 speed groupset versions work almost intuitively, offering a perfect amount of lever throw for each shift and positive, reassuring, clicks to announce each gear change. The current range of chainrings are manufactured through forging rather than machine cutting and are very stiff. Stiff chainrings make for positive, reliable front gear shifting and increased power transfer. The widespread use of Shimano components world-wide means that wherever your bike takes you, the chances are that spares will be relatively easy to find. Although to be fair, Shimano products are tested, tested and tested again, so you would be unlikely to be in need of a spare part in the first place. Dura Ace, Ultegra and 105 groupsets now feature a hydraulic disc version, so that a wider range of rider can choose the disc brake option. Shimano’s latest disc brake levers are more similar in looks and feel to their cable disc counterparts. Shimano’s bearings and hubs are among the best in the cycling world, particularly on higher end components, which can go on and on, with very minimal servicing. Shimano pack their bearings with their own grease which also lasts a long time. Reliability is Shimano’s watchword. 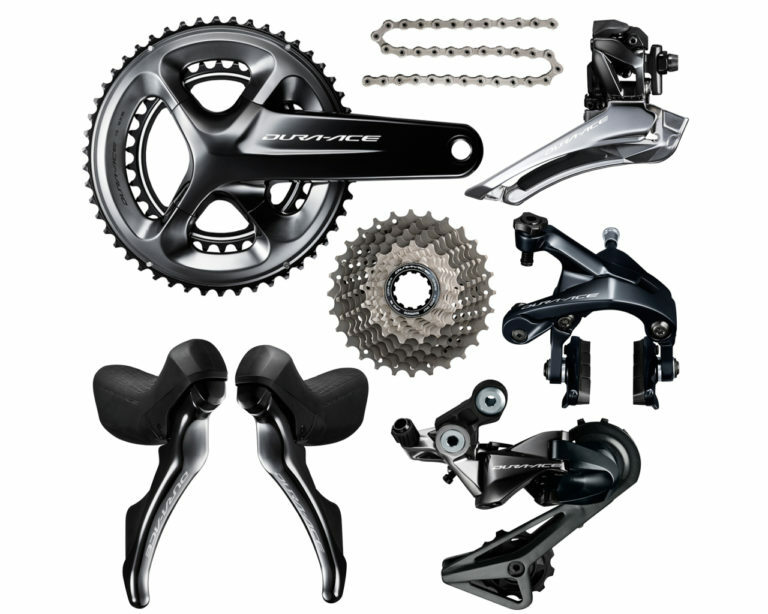 Cost effectiveness and innovations which make the current groupset range very hard to beat, help Shimano to reign supreme in the road bike component market. Shimano were the first to introduce the concept of a ‘groupset’ – components which integrate to work with each other. Shimano hold the vast majority of the world cycle component market and are the most recognisable worldwide cycling brand. 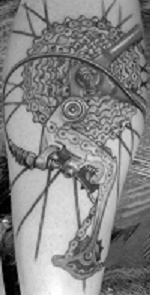 Well there you go – Shimano rear derailleur Tattoo! Pic courtesy of Pintrest Bicycle Tattoo. Based in Chicago, Illinois in the US. The Sram name comes from the names of its founders Scott, Ray and Sam. Since its start in 1987, Sram has retained a strong focus on the MTB side of its business, whilst simultaneously developing their road components. Innovation and new thinking feature strongly in Sram’s groupset ranges. The ‘new thinking’ outlook comes partly from being a relatively new company, and partly from having to come up with products not already patented by Campagnolo or Shimano. 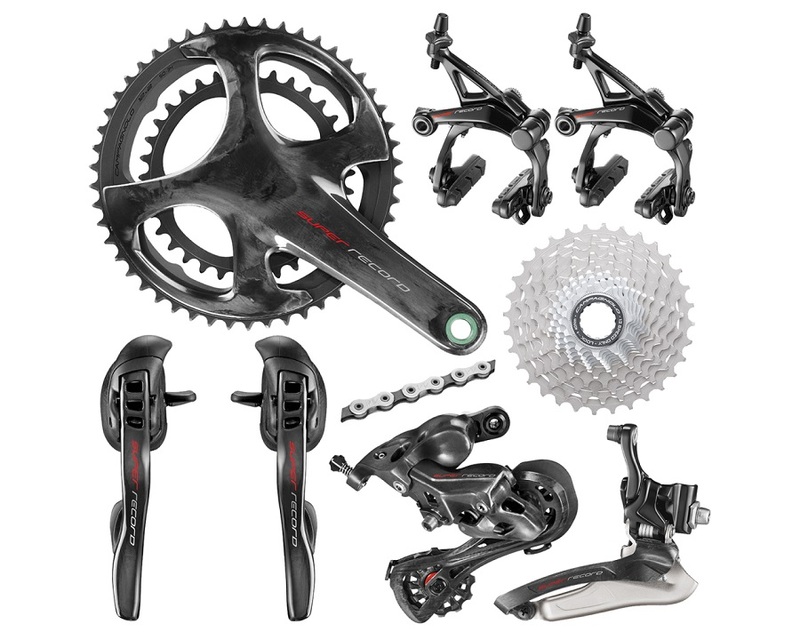 Groupsets from Sram are lighter than their comparable groupsets from other manufacturers, so if you are building a bike primarily with lightness in mind, Sram could be the groupset manufacturer for you. Sram’s Red eTap system features wireless operation and individual small, lightweight batteries in each gear component. The lack of gear cables results in a clean look eTap fitted bikes. The eTap system is a great example of how Sram innovate and try to come up the new alternatives. Double Tap shifting system has a positive almost clunky feel to it, shifting is fast and the levers can change-up to 3 gears at once. The double tap shifting method takes a little bit of getting used to. Shifting consists of a short lever tap to change-up and a longer lever push to change down. Double tap levers have simpler internal components and are generally lighter than the competition too. The speed at which Sram innovates new products is impressive. Where older cycling brands can be stuck in a traditional mind-set, this is not the case with Sram. 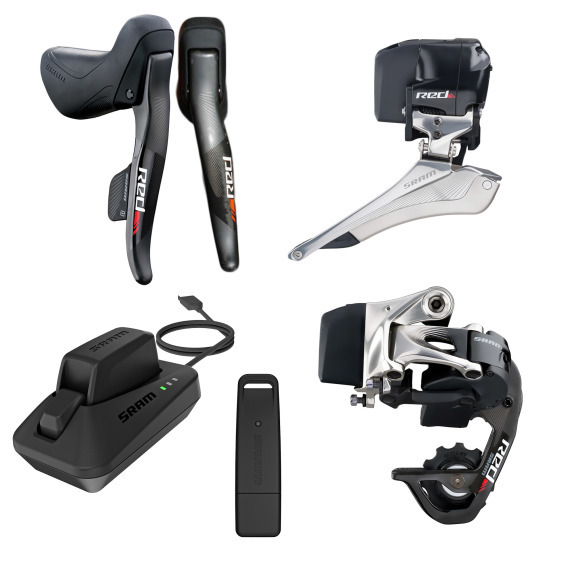 Not content with matching rivals with an electronic groupset, SRAM went straight for electronic and wireless. Sram’s. Innovation can also be seen in the BB30 bottom bracket format and single chainring ( 1X ) road groupsets which are the big player in the gravel bike market. The new ‘upstart’ in road components and have made incredible ground in a short time. Sram have taken market share from both Campagnolo and Shimano with innovative thinking in the design process. Not content to merely bring technologies across from MTB component manufacturing, Sram broke new ground, developing new components. 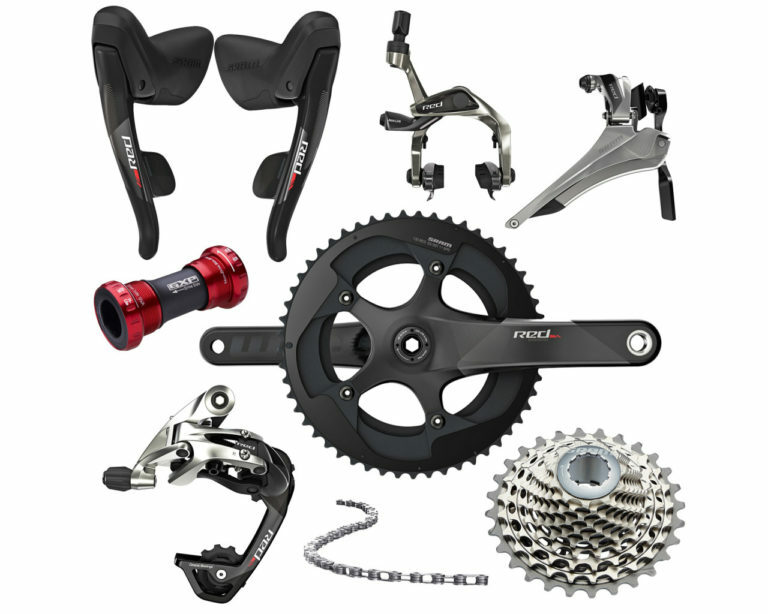 Sram groupsets are the lightest at each comparable price point. Could well be early days for tattoo committment from Sram fans. Here’s bit of Sram chain nestling in someone’s armpit. Pic courtesy of Pintrest Bicycle Tattoo. Two words to describe each? Regardless of your personal preference, competition between manufacturers can only be a good thing. Tagged 105, 11 speed, 5800, 6800, 9100, campagnolo, dura ace, groupset, mechanical groupset, R7000, R8000, record, Shimano, SRAM, sram force, sram red, super record, ultegra. Bookmark the permalink. Hellow! Thank you for the article. The Shimano shifting levers are seemingly set closer to the handlebar than Campi due to it’s construction. And, as my palms are not big it is more convenient for me to shift gears in lower grip with Shimano. Neveheless, all my road bikes were aquiped with Campi groupets. May be it is time to choose Shimano. Have had combinations of SRAM Force, Red and Rival on my bikes. Shifting is intuitive and hood size suits my small hands. My one issue nowadays, is the front shifting can be quite stiff. I have restricted blood flow to the left arm (subclavian occlusion) and find my hand goes numb after a while when riding, making front shifts nigh on impossible. Campagnola appeals but can’t reach the thumb shifters from the drops. Shimano I can’t accept the brake lever being part of the shift process. 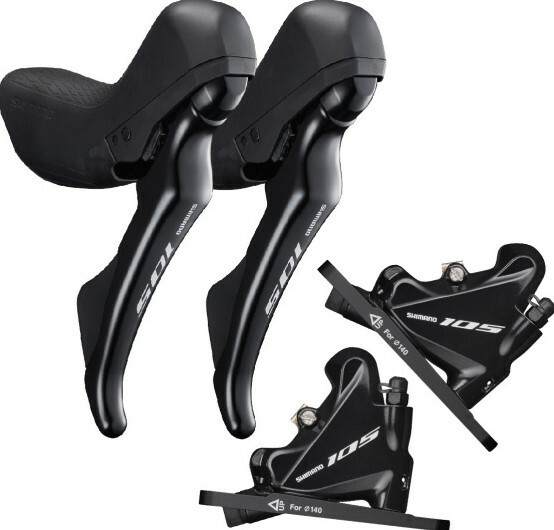 Di2 or etap look the way to go for my needs. Sram road levers can upshift more than 3 gears at a time. If you are in the smallest cog on your rear cassette you can shift 4 gears at once. You can shift 3 gears at once from all other positions. The additional shift available from the smallest cog is designed so you can shift through the entire cassette in 3 full lever throws. Campy’s two words do them no justice. Maybe reliabilicrisp and clunky.